Insignia at back should be right side up and centered. Fold long edge over several flat folds to about 6 inches from tip of neckerchief. A tight fold preents geathering around the neck and is more efficient than rolling or twirling. Draw neckerchief slide over ends and adjust to fit snugly. By vote of troop, ends may be left hanging loose or tied in a slip-knot. 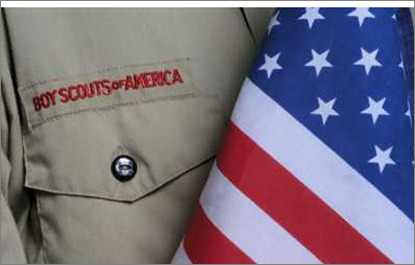 Official long-or short-sleeve shirt with red, blaze orange, or green shoulder loops on epaulets.Troop 41 wears a neckerchief and the shirt collar should be unbuttoned. Troop 41 wears the neckerchief under the open collar. all wear a patch on their sleeve which helps them identify their group. Olive web with BSA insignia on brass buckle;or official leather with international-style buckle or buckle of your choice,worn only if voted by the troop/team.Members wear one of the belts chosen by vote of the troop/team. Leather or canvas, neat and clean.